The automated, cloud-based DISC profiling of today can trace at least its core ideas back to ancient times. The idea of building a picture of a personality by combining a set of basic elements is a very old one, though its original incarnations have little to do with modern personality profiling. In fact it was the ancient Greeks who first thought about the human personality in this way. The roots of this idea may even predate the Greeks, but it was Hippocrates who first made a consistent attempt to describe behaviour this way. Hippocrates defined four personality 'temperaments', connected with four bodily 'humours', each of which was in turn connected to one of the four elements. These ideas about humours and elements turned out to be utterly wrong, of course, but the ways in which they were combined was intriguing. Some five centuries after Hippocrates, the Roman physician Galen proposed that the temperaments could be understood in terms of their relations to one another. For instance, a choleric personality (ambitious and strong-willed) was associated with the element fire, and it had a diametric opposite in a phlegmatic temperament (calm and and patient), connected with water. What's important about this view is that features of the personality can be interrelated and balanced against one another, with different personalities being related to combinations of different factors. Also important is the underlying structure, so that the various factors can be mapped on a pair of overlapping axes (an approach we call a biaxial model). Though the less scientific ideas of Hippocrates and Galen were jettisoned as science advanced, studies based on the four temperaments themselves continued until remarkably recently. As the concepts behind personality began to be investigated more rigorously, statistical analysis began to break down personality factors in a more scientific way. One of the foremost proponents of this approach was Hans Eysenck, whose analysis resulted in a biaxial model mapping factors against a pair of traits. Eysenck himself remarked on how similar this result was to the old idea of the temperaments, though the factors themselves were more technically defined. There are numerous comparable approaches (perhaps most notably that of Carl Jung, whose personality work is partly based on a relationship of this kind). Even the ancient Greek approach used a primitive 'biaxial model' to relate the elements to one another, and therefore also their related concepts within the personality. A more modern model, that of Hans Eysenck. Though more rigorously defined, this model still retains the old names for the basic types: Melancholic, Choleric, Sanguine and Phlegmatic (marked M, C, S and P above). Though DISC is based on a model of its own, it maintains the continuity of breaking down the personality into four quadrants based on two axes. One of these models was developed by American psychologist and writer William Moulton Marston, in his 1928 book Emotions of Normal People. This was the ultimate prototype of the DISC profiling technique: a pair of axes producing a set of four interconnected factors. Marston originally called these four factors Dominance, Inducement, Submission and Compliance, though 'Inducement' and 'Submission' now carry the more meaningful modernised names of Influence and Steadiness. It was during the 1940's that Marston's profiling technique came to prominence, when it was adopted by the U.S. military to help in recruitment during the Second World War. Over the following decades its simplicity and flexibility meant that it became more and more widely used across the world. In the early days, DISC profiles were created from paper questionnaires, marked and assessed by hand. With the advent of personal computers and the Internet, DISC adapted itself easily to a more automated approach, so that tests can now be managed in a completely automated way. Not only can tests be administered across the Web, but expert systems can compile customised reports from the results without the need for any human intervention. 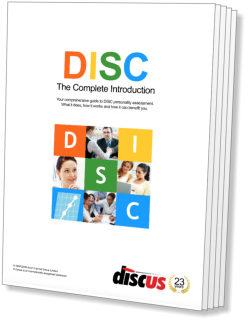 All this makes DISC an ideal profiling solution for the twenty-first century. Hippocrates: First suggested four temperaments or factors making up the personality. Galen: Organised the factors into a related pattern that can be represented by 'biaxial model'. Hans Eysenck: Created a statistical personality model based on a similar four-quadrant model. Carl Jung: Devised a psychoanalytic personality 'typology', also using four interrelated personality factors. William Marston: Published Emotions of Normal People in 1928, laying the groundwork for the modern DISC system.